Some days are easier than others as a trail worker. Like thru-hiking, there will be good days and bad days. But somewhere in the middle are days of sweaty, dusty, and sometimes frustrating work. 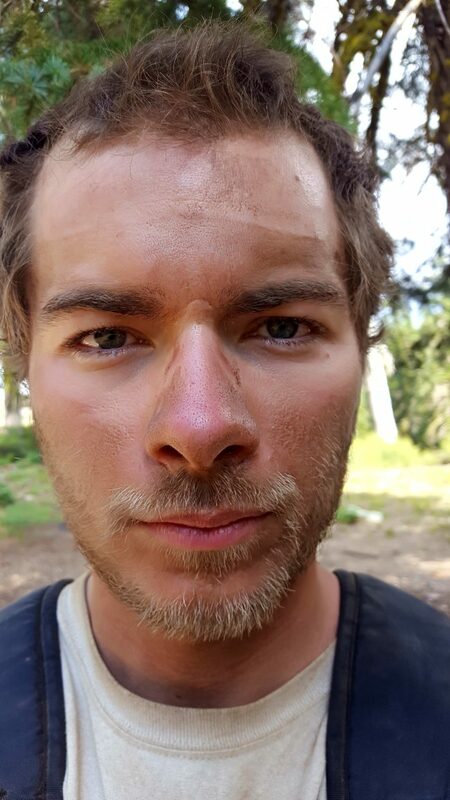 I’d like to give you a joyous little run-down of a typical day spent on a trail crew. Disclaimer: I say the following with a pinch of sarcasm, but mostly unmitigated truth. I loved my trail crew time, and was aware of what I was getting into. 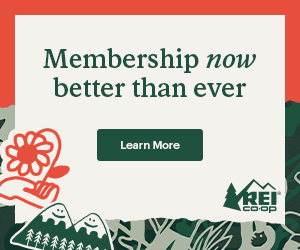 My term of service took place from April – September of 2017 with American Conservation Experience (ACE). 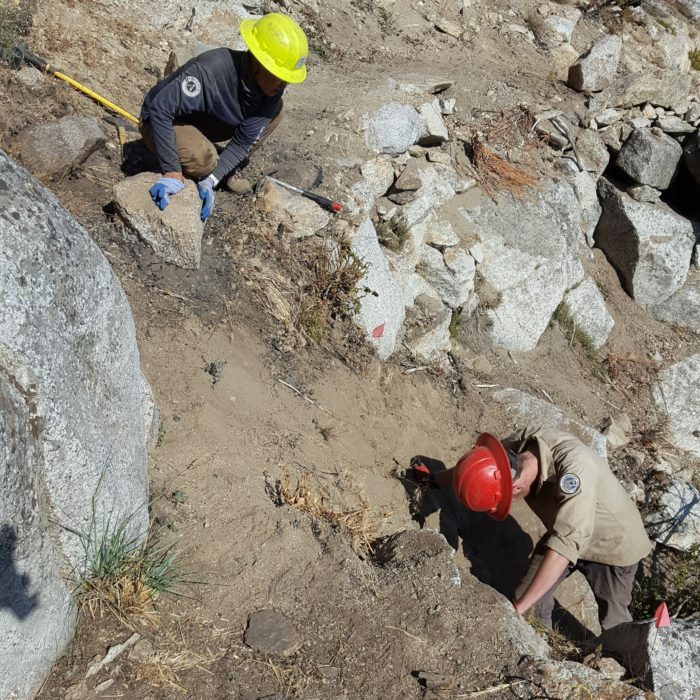 In short, we restored sections of the Pacific Crest Trail in the San Jacinto Wilderness, and cut new trail the Northern Sierra-Nevada region with a six person crew and a PCTA technical advisor. First things first: shut off the foghorn of an alarm going off and get yourself out of bed, or wait for a “GOOD MORNING! TIME TO GET UP!” call. Personally, being up first is great because you get to scream obnoxiously loud and watch people fumble out of their tent with confusion. I don’t mind the dirty looks. Breakfast time sees the emergence of everyone’s finest self: bed head, sweaty clothes from the previous day (still damp with partially hardened sweat stains), and dirt caked on their face with a pathetic smile. We all chomp on a cold bagel with cream cheese, eat a granola bar or an orange, and drink some coffee or tea. Whatever suits you. Express yourself. Some people deny breakfast food and eat crackers and Gatorade. Savages. After packing lunch and filling up water, we circle up for a stretch and safety meeting, discussing what lovely hazards could kill us. 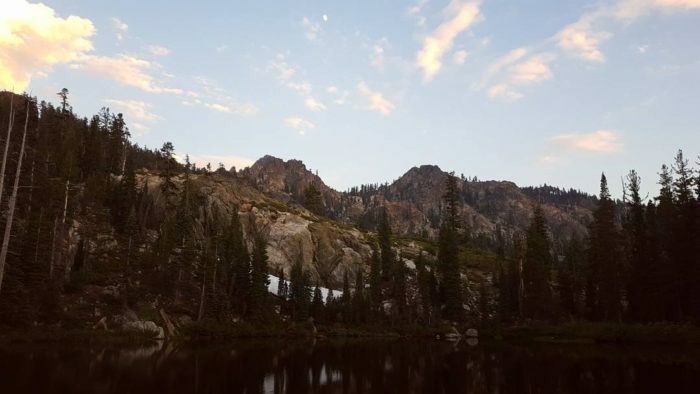 Rattlesnakes, lightning strikes, widow makers, or maybe loose footing leading to an unforgiving tumble through boulders and poisonous poodle dog bush (safety is important – be aware of your surroundings!). Cutting trail through hordes of Poodle Dog bush. Following our meeting, we hike to the worksite. Upon arrival, we begin digging, pruning, breaking, and muscling the trail into functionality. Typically the first few hours are the most difficult because it’s early, and time doesn’t seem to move – so put your head down and work. As with thru-hiking, trail work can get monotonous. Therefore, working near others is a great opportunity to discuss the meaning of life, get bugs in your ears, and also breathe each other’s body odor or dust being kicked up by tools. You’ll want to bring a bandana to wrap around your nose and mouth. Whatever work you have put forth starts to take shape. If it’s a rock wall the leader desires, it’s coming along well (provided all the boulders stay in tact, and don’t laugh themselves down a hill as we lament over our misfortune). Eventually, we find ourselves hunched under a small bush or a charred tree for lunch. This is when we all get to pay attention to how badly we stink, and try to take a nap after scarfing down a hastily crafted PB & J, some fruit, and whatever else we got our hands on. You can avoid some disappointment by stashing your water inside your pack, in the shade. No one likes warm water with lunch. Just as you cool down, you have to force yourself back into the eye of Sauron. This made me miss the freedom of thru-hiking – still hot? Take a few more minutes under your chrome umbrella, and wait out the heat. Not so in this situation. Reapply your dirt lotion (sunscreen) and get back out there. If you managed to take a short nap, the rest of the day is easier than the beginning. Take advantage of those breaks! Brimmed hard hats and sunscreen help mitigate effects of the harsh desert sun. The end of the work day draws near. Zapped from the unrelenting heat, it becomes hard to think of anything but eating and sleeping. We typically finish up what work we had, or end at a good stopping point. Before the hike back, we stash our tools and deduce who’s turn it is to make dinner. Back at camp, we collapse into our tents, change, maybe take a swim, and get some relaxation by playing games or reading. Once dinner rolls around, we devour food like rabid dogs. A couple lucky people get to take leftovers for lunch. The cooks spend a good chunk of their night cleaning dishes on a table that is just a few inches too short, which feels great on the back. Just a bit of hell to end the day (enjoy it). Usually by 6:30 or 7:00, things are wrapped up, and you’re free to socialize more, or turn in early. I was the old man of the group (figuratively) and always crashed around 8:00. A full day’s work, rewarded with a swim and sunset. I hope I didn’t scare you away from volunteering for trail work. It’s a very rewarding experience, and much like thru-hiking, the hardest days are the ones most remembered. A friend of mine once referred to these moments as “secondary fun”. Frankly, there is plenty of secondary fun being a trail worker, and like thru-hiking, it takes a while to realize how fun it actually was to be periodically miserable. Seeing the direct benefit to the trail and its users made all the hard work worth it. Love this article. 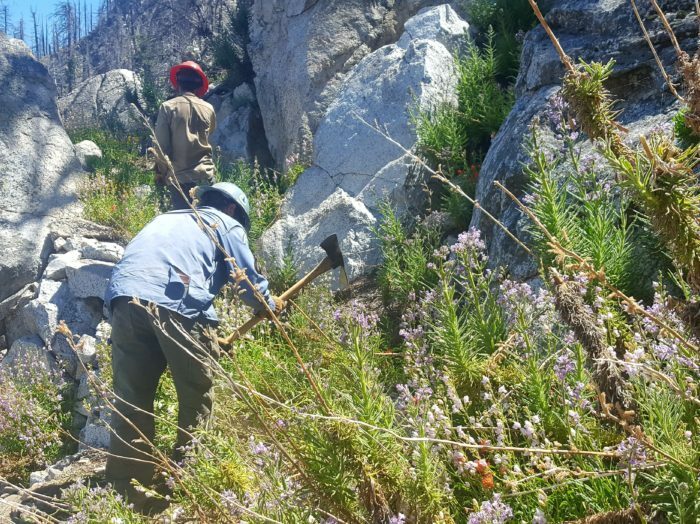 We have been thinking about doing trail maintenance & you gave a really good description of what a day in the life looks like, so thank you! Awesome! It’s so much fun. Definitely give it a shot!